Construction of Darwin CBD’s iconic third entry point Garramilla Boulevard is progressing well, with work on the new intersection with Woods St set to begin in early January 2019. A cul de sac will be constructed on Woods St where the road meets Garramilla Boulevard on the end of Woods St closest to Mirambeena Travelodge. 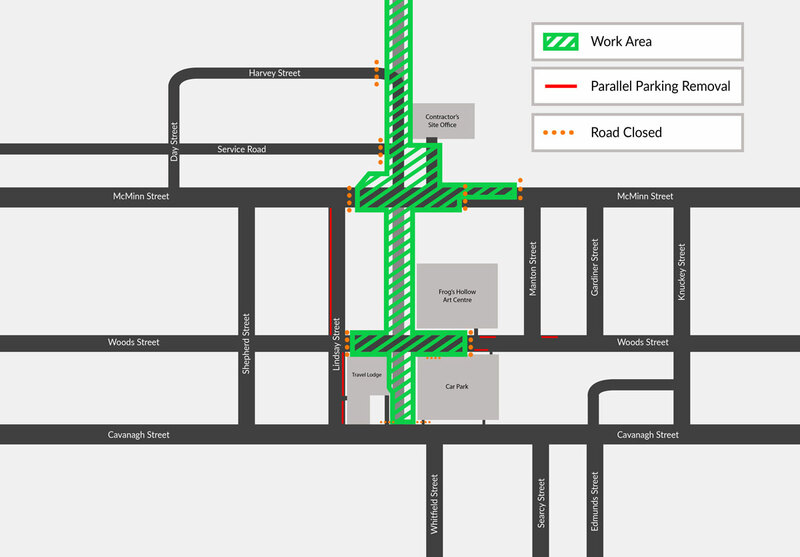 Woods St will be permanently closed to through traffic to allow this work to begin from Tuesday 8 January 2019. McMinn St will remain closed to through traffic until early February. Traffic diversions will be in place via Lindsay and Knuckey streets. It is expected the McMinn and Garramilla Boulevard intersection will be completed in the first quarter of 2019. Entry and exit points to the post office car park will be changed, and sections of Woods, Manton and Gardiner streets will be open to local traffic only.